Speaking of artificial vs. live Christmas trees, those air freshener plug-ins and sprays that smell like Fraser firs, Scotch pines, or blue spruces are pretty popular this time of year for people with trees of the vinyl variety. Isn’t it ironic, though, that products designed to make the air smell clean and fresh actually dirty the air instead? Which just goes to show that what appears on the surface doesn’t always match what lurks beneath. Think about that for a minute. Most commercial air fresheners use artificial, synthetic scents to simulate the good, natural smells of actual, natural elements. Um, why not just use those elements instead? Just like with scented candles, air fresheners can irritate the already sensitive lungs of any asthmatic, even those without allergies. Plus, environmental groups believe artificial fresheners create health risks for many people, not just asthma sufferers . The holiday season can worsen the problem because cold weather means doors and windows stay shut, trapping any particles inside so that air quality plummets. And, really, let’s not even get into the wasteful packaging those non-recyclable plug-in refills entail. Happily, what’s best for the environment is usually best for asthma, too, so paying attention to one issue means you’re multi-tasking for both! There are plenty of natural ways to fragrance up your home, ways that will save you money, save landfill space, and possibly help save your asthma kid’s lungs, too. Covering bad odors with *Country Apple Scent #2* never really works, anyway, so the key to air that smells good is eliminating the bad smells first. Set out bowls of pure vanilla extract or baking soda to absorb odors (vanilla will scent the air at the same time). Baking soda works on carpets, too. If you’ve got pets or children constantly spilling things or having accidents and your rugs are starting to get funky as a result, sprinkle some baking soda all over the floors, give it time to sit and soak up the smells, and then break out the vacuum. Once you eliminate the bad smells, you can create some good ones. Put a small pan on a back burner of your stove and set to low. Add a cup or so of water, a few drops of vegetable oil to work as a binding agent, and some whole spices or dried flowers for fragrance. 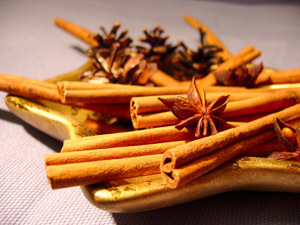 Whole cloves and cinnamon smell like holiday baking if you break or crush them to release the scent before adding to the water. Whole nutmeg works, too, but it costs a whole lot more. Add more water as it evaporates, and the mixture will last all day. Keep in mind, though, that plenty of asthma sufferers can’t tolerate many natural airborne particles any better than they tolerate artificial ones. (Remember the fireplace discussion? Woodsmoke is natural, too.) Anything small enough to get in the lungs has the potential to cause an asthma flare. So this method, while not toxic, may not work in your asthma home, either. For scent on a smaller scale and to avoid the problem above, mix together the same type of ingredients, add a few drops of essential oil, and place in small bowls all around the house. This is a less-invasive way to scent the air, but itâs also a more customized, personal one. 1. Place bowls of pinecones and pine needles all around your house. They look and smell like Christmas. 2. Squeeze a lemon half (dig out the seeds first, of course) into all your sink and bathtub drains. 3. Stack up lemons or oranges in clear bowls and vases. Pretty, festive, and fragrant without the hassle of actually making potpourri. 3. If the weather permits, open your windows for a half hour or so. My favorite way to make a home smell fresh is to let the actual fresh air in, although I realize this is probably more feasible for me than most people, considering my location. Thank goodness for this information! I really struggle with all scents around the holidays. The potpourri is very difficult to manage. My house generally smells of NOTHING. But I had never considered the bowls of vanilla or even just pine cones. It seems like I’m always trying to remove scent not add more! My tip would be not to fall for the hype with products like febreeze that remove scents. This has ingredients that irritate my airways big time. Friends and reletives may mean well in trying to make their home “scent fee” but this is one product to skip. Oh yeah, Febreeze is the WORST. Thanks for adding that……I think the only spray that bugs my Asthma Girl more is that spot cleaner for carpets–that’s truly nasty stuff. We have just the same problem with well-meaning friends and family–my mom didn’t get that even just using bleach in the next room would set off my daughter’s asthma until she actually saw the flare. I always tell them *If she can breathe it into her lungs—no matter what it is—it has the possibility of bothering her asthma. * It’s hard to wrap your mind around just how MANY products that rule covers, unless you’re dealing with asthma, I guess. I agree with both of you. Febreeze isn’t worth its weight in gold to me, even if it claims to reduce allergens. I have issues with my roommate, who for somereason like to complain to others that I don’t let her ‘clean.’ I let her clean, and I appreciate it when she does but she has to watch out for what she’s using. I think it is hard for everyone else to realize that scents can cause attacks, unless of course it happens to them. I do like your idea of pine cones in a bowl, I might have to try that. You’re right of course–I tend to get frustrated when I have to tell a family member AGAIN not to use harsh chemicals/cleaners/fresheners around my kid. Then I remember that, all my life until her diagnosis, I always thought asthma was no big deal and never gave it much thought–I didn’t open my eyes until she started struggling.